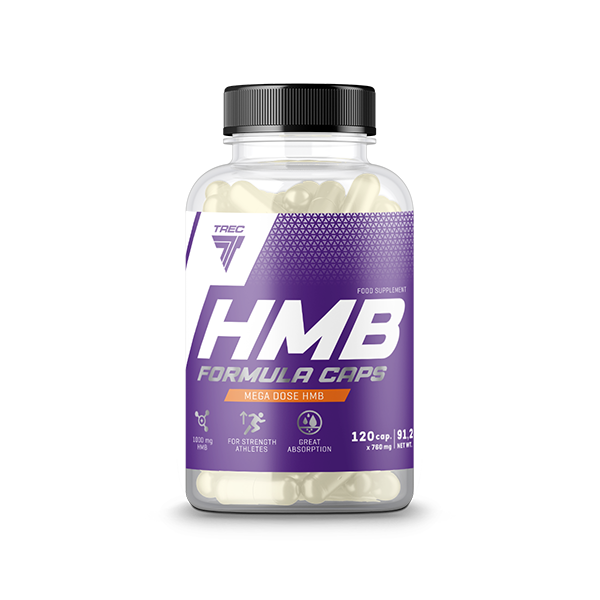 HMB FORMULA CAPS contain β-Hydroxy β-methylbutyric acid in calcium salt form. This short-chain fatty acid is produced from an amino acid (L-Leucine) after each intense physical exercise or as a result of long-lasting stress. Recommended daily portion is 6 capsules. Take a single serving of the product ‒ 2 capsule with 300 ml of water. Take 3 servings daily. On workout days: 1st serving – 30 min. before your first meal, 2nd serving – immediately after your workout, 3rd serving – at bedtime. On non-workout days: 1st serving – 30 min. before your first meal, 2nd serving – 30 min. before the main meal, 3rd serving – at bedtime. BEST BEFORE END, BATCH NUMBER, COUNTRY OF ORIGIN: See the side of the packaging and weld. β-hydroxy β-methylbutyric acid does not originate from Poland. INGREDIENTS: Calcium β-hydroxy β-methylbutyrate (81%); capsule shell (gelatine; colour – titanium dioxide); anti-caking agent – magnesium salts of fatty acids.